In my past life as yacht crew and now as a yachting journalist, people often ask me where my favourite yachting destinations are. They expect to hear the usual suspects, I think. Perhaps the Amalfi Coast, with its bougainvillea terraces and dizzying clifftop views, the French Riviera’s heady combination of Michelin star dining and pine-scented coves, or the exotic French-Caribbean beauty of St Barts. Undeniably lovely and glamorous as all those places are, it’s the wild places—the ones where superyachts are dwarfed against a primal landscape—that have my heart. Remote cruising fills me with endless wonder, and if I don’t see a single other superyacht in my travels, then so much the better. Cruising New Zealand is like that. In this pristine country at the bottom of the world, superyachts are still a rare enough sight that their visit will be documented in the local paper, and locals will come down to the shore to see them pass. It’s changing of course, with the Viaduct marina in Auckland welcoming more luxury yachts by the year, but every mile you travel further from of the yachting centres, the more the world falls away and you are on a breath-taking adventure deep in the South Pacific, in an emerald country carved by ice and fire. Cruising in New Zealand is a story in three parts: a ‘choose your own adventure’ kind of experience, where the north of the island is astonishingly different in scenery and character from the south, with something of both to be had in the middle. I was lucky enough to have over a month cruising on a yacht there, but for those charterers limited to a week or 10-day trip will, rather sadly, have to make your choice of the three. 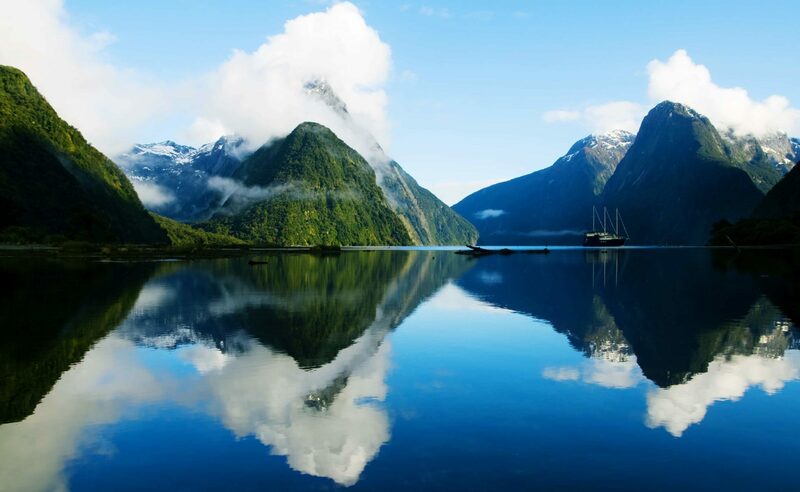 New Zealand, ‘the land of the long white cloud’, is a long, thin country made up of two islands, one above the other, anchored deep in the South Pacific. Its north, roughly at the same latitude as Sydney, Australia, has more than a hint of the idyllic South Pacific about it—turquoise waters, white sand beaches, the odd palm tree between the pines. Only the seals and penguins flitting through the water next to the yacht let you know that Antarctica is the next landmass to the south, and that swimming is therefore strictly a summer activity. Our North Island charter started off in the Viaduct, Auckland’s famous port where the America’s Cup base their fleet, and where fashionable restaurants and bars show off Auckland’s impressive gourmet scene along the waterfront. However, our yacht’s owner was the adventurous type so we didn’t tarry here long, quickly making our way out of the busy harbour and up to the Bay of Islands. When you see the Bay of Islands, you’ll immediately understand why the Kiwis have more boats per capita than any other country on earth. This gentle archipelago of rolling hills and blue-green coves makes for spectacular cruising, with hundreds of protected anchorages and quaint colonial villages. The water up here glows sapphire and jade in the shallows, and white sand beaches are backed by sub-tropical forest, sparkling waterfalls, and vineyards that stretch down to the sea. Far offshore, Poor Knights Island offers one of the top 10 dive sites on earth, with the world’s largest sea cave and 100m undersea cliffs, and the waters in the region are so rich in life that anyone can become a prize fisherman merely by dangling a line off the aft deck. 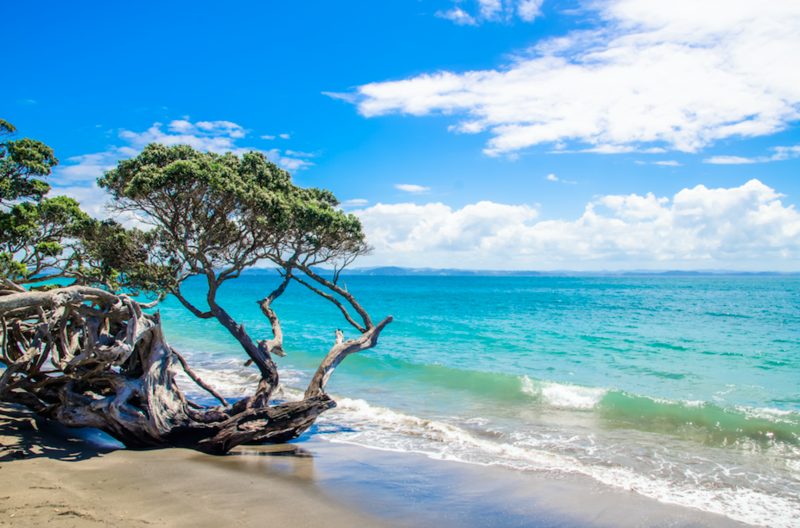 Our yacht spent a week floating through this earthly paradise and down through the Hauraki Gulf to the Coromandel, where hiking paths weave through towering Kauri forest and volcanic hot springs well up on soft sand beaches. 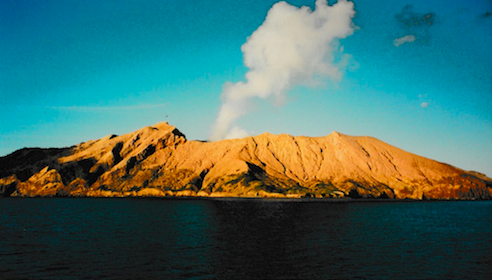 On our way southwards, we passed an island volcano which gently puffed white smoke into the sky to blend with the passing clouds. The North Island of New Zealand is truly a marvellous place. Yet to be honest, this was not the New Zealand I had come to see. I had watched Lord of the Rings. 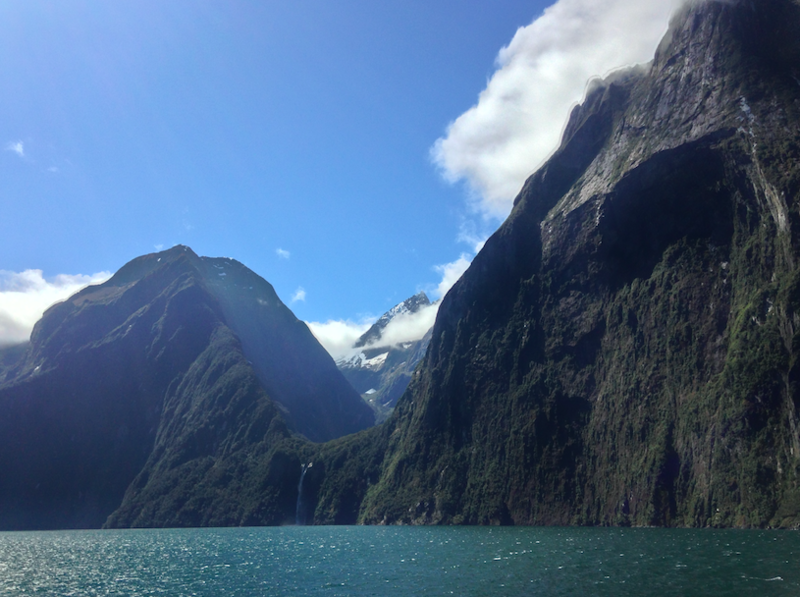 The Bay of Islands and Hauraki Gulf are truly beautiful, but I wanted film-set, heart-in-your-mouth kind of grandeur—all fiords and glaciers and snow-capped mountains— and would settle for nothing less. But our trip was far from finished, and I would get more than I could have possibly bargained for as we moved further south. I woke up, looked out my porthole and smiled. I could see mountains. The water shone like golden sheet metal in the morning sun, the yacht’s wake sending out ripples in the glassy surface. We had arrived in the Marlborough Sounds, a vast flooded river valley network that stretches across the top of the South Island. I went out on deck with a mug of coffee, the air was a shade cooler than in the far north, but a fine, sunny day was on its way. The black fin of a dolphin broke the mirror-still surface, then another and another, until the yacht was surrounded with a resident pod of bottlenose dolphins. I’m not sure how long you need to spend at sea to stop being excited when you see dolphins, but even after years living on boats, spotting dolphins playing in the bow wave still makes me grin like a child. We saw the dolphins many times on our days floating through the Marlborough Sounds, and saw people swimming with them from the few other boats we saw in this quiet, splendid place. The Marlborough Sounds are heaven for the nature lover. Lush green mountains fall away into the protected sounds where killer whales come to hunt in tranquil bays, and emerald islands are scattered like jewels through the blue. Hiking and mountain bike paths lead away from aquamarine coves and sandy beaches, and the deep, cool waters hide many diving treasures, including a sunken cruise ship. The Marlborough Sounds are world-famous for their wineries, and our guests got off the boat often, for wine-tastings and bushwalks and afternoons exploring historic whaling towns. They’d return to the yacht for candlelit dinners on deck, happily chatting about everything they’d seen, and the next morning we’d cruise to another spectacular anchorage for another day of adventure. It was pristine cruising, wild and pure. Still, the rugged south was calling. Working on a superyacht is an unusual life, full of strange sights and interesting people. But there are moments that stand out in the memory, and our cruise down the Western Coast of New Zealand is one of them. I went out on deck at sunset, and the world was lit up like fire. The Southern Alps reared up mighty above the sea, their snow-capped peaks burnished red and gold by the setting sun. It was staggering. I stayed until it got dark and cold, the wind whipping across the moonlit water as we moved further south. As I went to sleep, the boat pitching slightly beneath me, I could only imagine how incongruous the yacht must have looked, a 50m superyacht reduced to a white speck in the dark sea against a towering backdrop of moonlit mountains. The next morning, the captain came to me, showing me the printout of the depth sounder reading from overnight. ‘What do you see?’ he asked, smiling. I couldn’t quite believe the shape I could see sketched in the readings. ‘Is that a…’ I stopped and looked at him, wondering if this was some kind of trick. That day, as we continued to make our slow way down the west coast, I saw more marine life than I had ever seen from a yacht, or perhaps will ever see again. It was as if we were in our own David Attenborough nature documentary. Dolphins surrounded the yacht—50 or more at a time. Colonies of walrus seals sat floating in the water on their backs, heads up watching us as we passed, looking for all the world like they were sitting in armchairs in front of the television, their big bellies protruding from the water like that uncle who loves beer and football in equal measure. ‘A killer whale!’ One of the deckhands shouted, pointing to where a huge fin appeared in the distance, then vanished. All around, seabirds flocked and dove for fish in the teeming waters. The crew threw a line off the back of the yacht as we cruised slowly down the staggering coast, and the chef cooked up the freshest fish in the world for dinner that night. We left the open sea and entered the fiordlands, where the great white yacht powered up deep, crystal clear gorges carved by ancient glaciers. Tiny fiord penguins swum alongside the yacht, and fat seals sat basking on rocks, their grey-black fur gleaming slickly in the sun. I stood watching for a while, pointing out the seals to the yacht’s engineer who was passing. ‘Rats of the sea’ he said, unimpressed. But then, engineers were born grumpy. It was much cooler down here in the fiords: the distant peaks were clad in snow, and mist hovered over the water in the mornings, dripping down from the temperate rainforest. The sound of rushing water was everywhere, snow-melt streams of milky ice blue gushed into the fiords from mountain streams, and waterfalls plunged from the cliffs, filling the air with rainbows and shimmering drops of white. The captain manoeuvred the yacht’s bow up to a waterfall running off a glacier, and I filled my glass with icy cold water that had been captured in the glacier for at least 10,000 years. 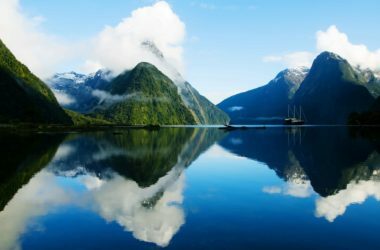 New Zealand Fiordland National Park is immense, with fiords riddled into the mountainous coastline like long, creeping fingers. 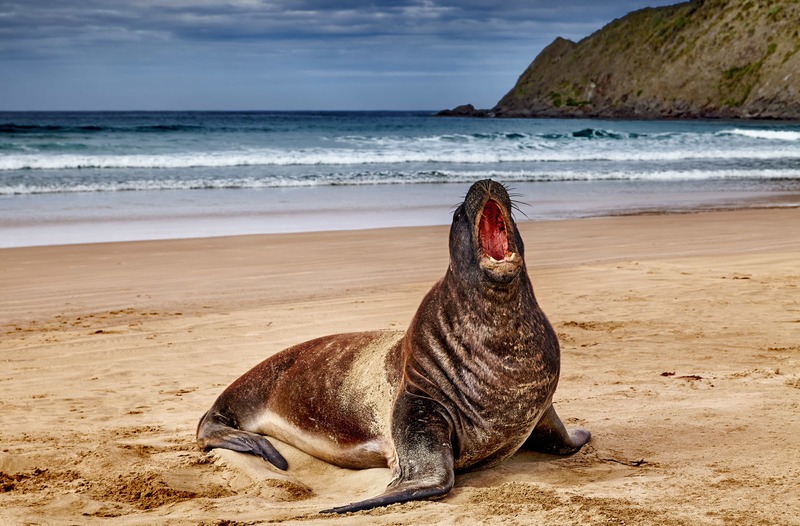 Our yacht cruised up quiet inlets of startling beauty, where seals played under waterfalls and green vegetation somehow finds life on sheer cliff walls that are slick with running water. The guests spent their time bushwalking and kayaking along glassy fjords under mossy, towering rock faces, although they shied away from scuba diving in the cold, crystal clear waters down here near the bottom of the world. Mostly, they dined and read and played card games on deck, as some of the most spectacular scenery on earth floated by. Time slowed, as we cruised ever southwards through the Milford, Dusky, and Doubtful Sounds, until we reached the southern tip of New Zealand. Emerging from the fiordlands, we cruised around the bottom of the country to pretty Dunedin, an old Scottish city of stone colonial mansions, grand gardens, and high teas. Built in the gold rush, Dunedin has some of the finest Edwardian and Victorian architecture in the Southern Hemisphere, set in a rolling landscape of hills and cliff-lined bays. Which was all very lovely, but my heart was left on the wild west coast, where I felt I had fallen headlong into a National Geographic photo shoot, and my eyes could never take it all in. So, which adventure would you choose on a New Zealand yacht charter? North, Middle, or South? The gentle South Pacific archipelago of the Bay of Islands, spectacular wine and bushwalking country in the Marlborough Sounds, or a land of ice and fire in the fiords?